A classic French Canadian holiday pie. Place one pie crust into pie plate, reserving the other for the top. Refrigerate both crusts until needed. In a medium sauté pan over high heat, heat oil. Add ground beef and pork, cook until browned. Add onion, mushrooms and garlic: sauté until mushrooms become soft. Pour beef broth over meat, season with salt, pepper, cloves and rosemary. Reduce heat to low and simmer until reduced by half. Add butter, stir until completely melted. Pour beef mixture into pie plate: top with remaining crust. Bake for 25-30 minutes or until pie crust is golden brown. 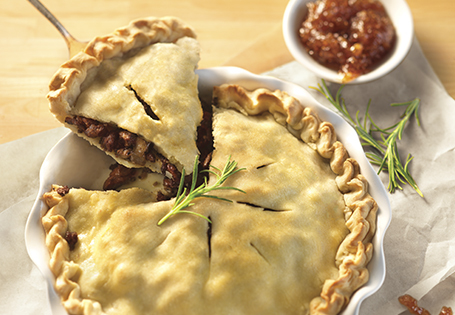 Allow pie to cool for 5 to 10 minutes before serving.